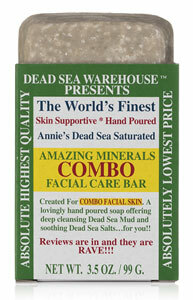 Experience this wildly popular skin-soothing Dead Sea Amazing Minerals Combo Facial Bar and treat your skin to something special with amazing cleansing and soothing properties! Naturally soothing and non-drying for itch-free skin, the Dead Sea minerals support clear, healthy skin without fragrances, colors or anything unnecessary. This is the MOST clarifying hand-crafted facial bar we've tried, pairing Dead Sea Salts with Dead Sea Mud to give you an effective, luxurious and affordable facial bar for combination skin that's not only exceptional, it's affordable! Lovingly hand-crafted and made only with pure olive oil, coconut oil, sustainably-sourced palm oil, Dead Sea minerals and Dead Sea mud, you're getting a blend of amazing skin nourishing non-GMO ingredients with nothing unnecessary. 3.5 oz. (99g) bars are $6.99 each.